Birth date (Day-month-year)10/9/2002 Age.15 Form (grade)1. 1. Tribe /location from Luyha ,Bungoma county. 4. Least favourite school subject Physics. 5. Favourite activity or activities .Singing. 6. What vocations or occupations interest you?.Doctor. Cooking/Baking Mandazi and other Simple African food. I live in an orphanage in Webuye in Bungoma county. Tell us about your siblings (if any); I have three siblings who also live in the orphanage. Tell the story of your life up to this point; I grew up in the orphanage together with my siblings. When I completed primary school I joined New Dawn. I would like to be a doctor. When I get a job I will help in educating my siblings and also in helping children in the orphanage. If you would like to help Dorcas, please provide us with your name and email and hit "SUBMIT" before clicking the "Continue" button below. You will then be asked for your payment information. 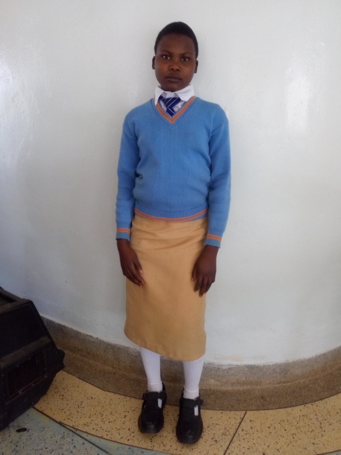 On behalf of Dorcas, THANK YOU!